From rolling plains and farmland to deep canyons and mountain ranges, South Dakota offers a variety of scenery. And what better way to experience it all than on the seat of a motorcycle? 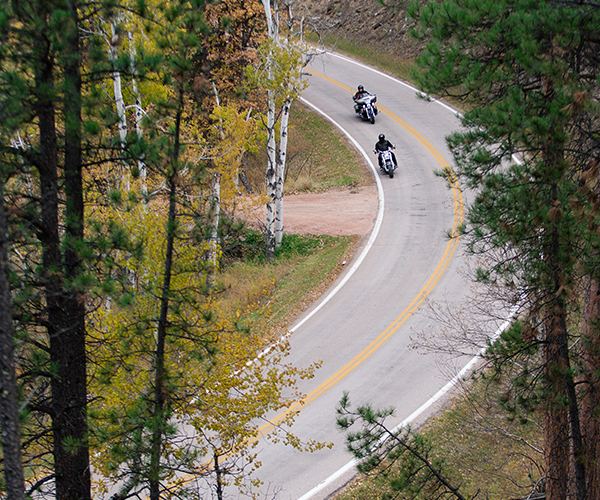 Though there are thousands of miles of beautiful, travel-worthy roads, we narrowed it down and compiled a list of our favorite scenic motorcycle rides in South Dakota. Description: Even though it’s a short ride, it is one of the most scenic the Black Hills area has to offer. No matter what time of the year you travel, the scenery will be unbelievable, but be sure to check a fall ride off your bucket list; the canyon’s autumn foliage is breathtaking. The ride consists of winding roads with remarkable rock formations lining the byway’s twists and turns. See the Northern Great Plains Grasslands, waterfalls, pine forests and miles of hiking trails. Pack a picnic lunch and stop at Iron Creek or Roughlock Falls Picnic Area to enjoy some peaceful views. Description: This route is a motorcyclist’s dream. Looping through western South Dakota, you’ll encounter incredible twists, switchbacks, pigtail bridges, hills, valleys and elevation changes. Not only is the route challenging, it packs more scenery per mile than most rides. From the historic town of Keystone, through scenic Custer State Park and past Mount Rushmore, allot time for frequent stops to enjoy the great views. Description: Follow the rugged, underdeveloped terrain of the Native American Scenic Byway and experience great views of diverse landscapes and the Missouri River. The route runs north and south through central South Dakota, allowing you to travel through Yankton, Crow Creek, Cheyenne River and land of the Standing Rock Sioux Tribe. Tribal history and culture are showcased on the natural path cut by the Missouri River. Landscapes along the route include mixed-grass prairies, rolling hills and limestone cliffs. An abundance of wildlife may be seen along the byway including prairie dogs, bison and elk. Description: The Vanocker Canyon ride is a hidden gem of western South Dakota full of twists, turns and some amazing views. Forests full of birch and aspen trees provide a peaceful backdrop along the byway. This route takes you to the western side of Rapid City, along Sheridan Lake Road and into historic Deadwood. The road winds southwest for about 17 miles to the tiny historic community of Nemo. Head north down Nemo Road and enjoy the scenic roadside views of Box Elder Creek. Stop in the western town of Deadwood and visit the infamous Saloon No. 10 for gaming and a good time. Description: Traveling from Sturgis to Devils Tower and back, this route takes you from a great area in South Dakota to a great area in Wyoming. The route is full of long sweeping curves that take you through diverse scenery including mountains, meadows and Devils Tower National Monument. The wide open roads are in good condition with gradual climbs and turns. Description: Depending on your riding skill level, this is one of the best rides South Dakota has to offer. You’ll ride through switchbacks, tight curves and pigtail bridges, all while climbing and descending almost 2,000 feet. The Iron Mountain Road part of this ride is 17 miles from Custer State Park to the entrance of Mount Rushmore and contains 314 curves, stacked loops of wooden bridges and one-lane tunnels. Needles Highway is a challenging ride, but one you won’t want to miss. Ride slow and enjoy the beautiful scenery. Description: Custer State Park is the second largest state park in the country, covering 71,000 acres of amazing terrain. Enjoy all the wildlife, mountain peaks and granite spires the park has to offer from the seat of your motorcycle. Including the entire 18-mile Wildlife Loop Road, this route ensures you won’t miss out on a thing. This route stays interesting with open grasslands, plenty of curves, a few tight switchbacks and, if you’re lucky, a free-roaming bison herd. Description: Weave through old stone pillars and mountains and follow moderate turns and climbs through Badlands National Park. Enjoy topography that has evolved into chiseled spires, deep canyons and jagged buttes. This is an easy ride that you’ll want to take slow to fully experience the amazing scenery.